A recent post on this blog talked about the sprint to the “climate cliff,” and focused on 350.org’s latest advocacy campaign calling for divestment by higher education endowments in fossil fuel industry stocks. As students return to UConn from the long inter-session and holiday break, some may ask “how can I reduce my personal carbon footprint?” OEP intern Meredith Hillmon, a 4th semester Environmental Science major, researched the EU’s recent study about individual behavioral change options for reducing carbon emissions. She summarizes the report below. A 2012 European Union (EU) study emphasizes the importance of changing behavior to reduce greenhouse gas (GHG) emissions. Recommendations in the study apply to households and individual consumers, and translate as a carbon-reduction roadmap for UConn students. The report focused on GHG emission reduction potentials ranging from driving hybrid or electric cars, to tele-working, virtual meetings and adopting a vegetarian diet. While purchasing a more eco-friendly vehicle or teleworking may not be immediate options for UConn students, there are still other ways for the EcoHusky in all of us to reduce our greenhouse gas emissions. In terms of mobility, the EU highlights the use of more fuel efficient cars, carpooling, sustainable modes of transportation and reduced travel distance. Watch for new campus parking fee rates next fall that will provide discounts for students who are ridesharing or commuting in fuel-efficient vehicles. Students can also take advantage of UConn’s car-sharing program, operated by Hertz on Demand. For a low hourly rate, a student can rent one of four Ultra Low Emissions Vehicles (ULEVs) stationed around campus. Another point emphasized by the EU is the importance of being aware of thermostat and ventilation settings. Whenever possible, students should make the effort to reduce the heat in their dorm (or the air conditioning in their apartment) by one or two degrees, and learn the optimized thermostat and ventilation settings for the best heating and cooling efficiency. The water temperature and length of showers can also significantly impact greenhouse gas emissions. When it comes to reducing your carbon footprint, long, hot showers are discouraged. Switching to a vegetarian diet, or a reduced animal protein diet, is another behavioral change supported by the EU study. Eating more veggies and less meat can be healthier for you and the environment! Red meats have the largest carbon intensity, whereas vegetables and fruits have the lowest carbon intensity. UConn offers plenty of vegetarian, vegan and locally-grown produce options throughout campus dining facilities, especially at Whitney Dining Hall, making it easy for students to reduce their carbon footprint through diet. Behavioral changes can produce considerable reduction in greenhouse gas emissions. The EU has illustrated and ranked several doable sustainable options, many of which are available to students at UConn. Each of the following makes a significant impact in the long run. By implementing even one of these behavioral changes, you are already reducing your carbon footprint. *Based on the comparative analysis in the 2012 EU study of the carbon-mitigation potential, through 2050, of various behavioral change strategies. Food estimates based on commercial farms and fisheries. In the interest of keeping climate change at the forefront of the UConn community’s attention, the Office of Environmental Policy will help coordinate a system-wide interdepartmental “teach in” this upcoming April. 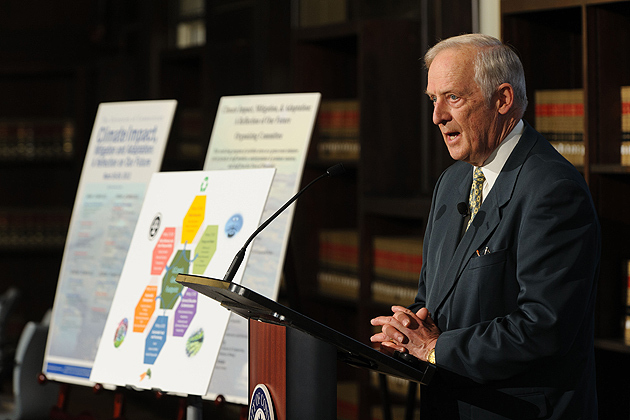 Tentatively titled “Our Environment: A Dialogue on Change,” this week-long effort, from April 15-22, is set to continue building on the momentum set by a number of successful Climate Impact Mitigation and Adaptation (CIMA) events in the spring of 2012. Kicking off in March last year, the CIMA lectures featured university faculty and guest speakers such as independent journalist and author, Mark Hertsgaard, and the Teale Lecture speaker, Michael Mann, an award-winning climatologist. Other events included a panel discussion focused on incorporating various aspects of sustainability, a Climate Impact Expo in the town of Mansfield, and an interactive Eco-footprint exhibition developed by the EcoHusky student group. 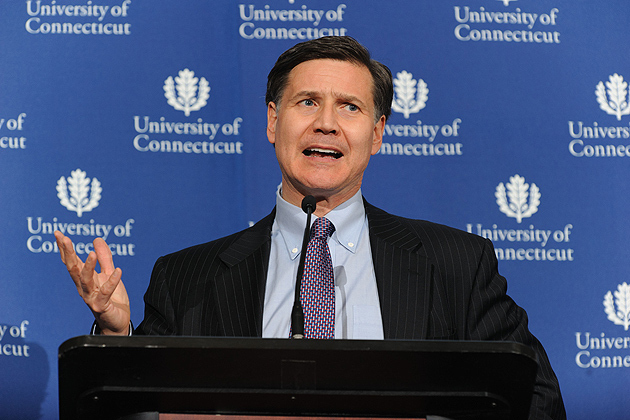 Very importantly, President Herbst reaffirmed the institutional commitment to UConn’s Climate Action Plan (CAP), which had been approved by her predecessor in 2010, and endorsed a new Climate “Adaptation” section of the CAP that spoke of our dedication to help communities more proactively address the effects of climate change and sea level rise. The reactions of students were very positive, as shown by the overwhelming attendance of the Michael Mann lecture and the passionate participation in discussions during both the sustainability panel and at the close of each lecture or expo. This year, the UConn community can expect another well collaborated and dynamic CIMA week planned by the organizing committee of student, faculty, staff and town representatives. Given the success of last spring, the committee aims to focus the month of April on the environment in whatever way relates best to each department. In order to reach a wider audience and engage in a broader discussion, CIMA 2 will feature a week long “teach in” in which faculty are provided with pertinent instructional materials that can be incorporated into a class or two during the teach-in. Scheduled for the week of April 15th to April 22nd(Earth Day) this series will also encompass various events focused on the environment and culminate with the annual Earth Day Spring Fling, the annual main and regional campus celebrations co-sponsored by the OEP, Dining Services, EcoHusky and EcoHouse! (1) 5 April – Humanities Institute “Day in the Humanities,” (2) 9 April – special lecture on ‘Silent Springs’ by historian, Naomi Oreskes, (3) a “Coastal Perspectives Rachel Carson Symposium” at Avery Point, (4) 12 April – a tentatively scheduled Law School special conference on natural gas and nuclear power, (5) 18 April – a Teale Lecture Series presentation, “The Lost Woods of Childhood” by poet Allison Hawthorne Deming. Several UConn scientists said it well in a recent Hartford Courant op-ed piece, “…we find ourselves beset by one of the biggest challenges our country has ever faced. No, it is not the fiscal cliff we hear so much about. The largest challenge our country faces is the climate cliff. If we do nothing to address climate change in the next four years, the solutions become more limited, more expensive and more damaging to our country.” Kudos to Doctors Urban, Capers, Likens and Anderson whose clear commentary called for leadership from President Barack Obama to unite Americans and begin a bipartisan fight against this common threat to our national security. Speaking of food, the economy and climate, Mark Hertsgaard’s article in Newsweek and the Daily Beast, provocatively titled “The End of Pasta,” is recommended reading about how climate change and the discovery of new American oil fields have combined to threaten the future of rice, corn and grains, such as North Dakota-grown durum wheat, used to make pasta. 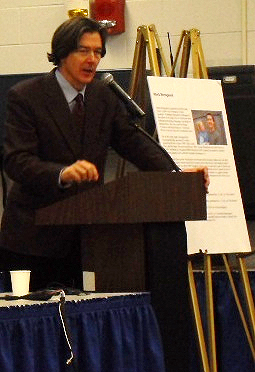 Author Mark Hertsgaard speaking at a CIMA program jointly sponsored by UConn and the Town of Mansfield on March 27, 2012. EcoHuskies will recall that Hertsgaard was a featured speaker last March at UConn’s Climate Impact Mitigation and Adaptation (CIMA) events. In his keynote address at a CIMA program co-sponsored by the Town of Mansfield, he offered excerpts from his latest book about coping with climate change (“Hot: Living Through the Next Fifty Years on Earth”). In his Newsweek article, he describes how “the development of controversial “fracking” technology, which enables drillers to extract oil and natural gas from previously inaccessible underground locations, has given rise to a massive expansion of production” – one that could make the U.S. the leading oil-producing nation in the world by 2020. A new strategy promoted by 350.org and advanced by a few small colleges across the country calls for higher education endowments to divest in fossil fuel stocks. Activist Bill McKibben of 350.org explained the rationale for divestiture in a Rolling Stone article published last summer. Simply put, the amount of carbon contained in the world’s proven oil, coal and gas reserves – the assets that the fossil fuel industry is committed to extract and sell in order to realize full economic value for their owners, investors and shareholders – is five times greater than the cap on carbon emissions that scientists say would prevent a catastrophic global warming of more than 2 degrees Celsius. If energy companies could not exploit these reserves, their values would plummet, because they would be writing off, or “stranding,” an estimated $20 trillion in assets. McKibben cites the successful 1980s campaign to divest in companies doing business in South Africa, when 155 U.S. college campuses joined 19 states, exerting international financial and political pressure that eventually led to the end of apartheid. Unfortunately, odds are against 350.org’s fossil fuel divestiture campaign. According to a recent article in The Chronicle of Higher Education, colleges and universities are less willing than they might have been 25 years ago to use their endowments as tools for advancing social or environmental goals, or frankly for any objective other than maximizing return on investment. Coming out of a deep recession, especially at public universities where state appropriations have been slashed, most college endowments have set ambitious goals for growth, and fossil fuel company stocks have been and will be among the most profitable. Let’s resolve that 2013 will be the year for political leadership and non-partisan policies here in the U.S. and around the world to address climate change. The environmental and economic consequences are too severe and likely happening sooner than predicted if we continue accelerating down the road to the climate cliff.